aham brahmasmi (I am Brahman) ? Almost a year back someone asked me`What is your opinion on ahaṁ brahmāsmi ? I gave a reply but I wasn’t happy with my answer and realised that my own understanding of this important statement is in not very clear. I looked for a reply and found that Srila Prabhupada often spoke about it in his lectures and also wrote about it in his books as well. I finally found the time today to post this long written blog, I hope it helps everyone in their own understanding of this important statement from vedas. False ego means accepting this body as oneself. When one understands that he is not his body and is spirit soul, he comes to his real ego. Ego is there. False ego is condemned, but not real ego. In the Vedic literature (Bṛhad-āraṇyaka Upaniṣad 1.4.10) it is said, ahaṁ brahmāsmi: I am Brahman, I am spirit. This “I am,” the sense of self, also exists in the liberated stage of self-realization. This sense of “I am” is ego, but when the sense of “I am” is applied to this false body it is false ego. When the sense of self is applied to reality, that is real ego. There are some philosophers who say we should give up our ego, but we cannot give up our ego, because ego means identity. We ought, of course, to give up the false identification with the body. ( BG 13.8-12 purport). I also found that this is one of the four so called `mahavakaya’ of mayavadis. Every person is actually Brahman, spirit soul. We are not actually the body. Awareness of ahaṁ brahmāsmi (“I am Brahman”) is actual self-realization. According to Vedic culture, one must understand that he is Brahman, not the body. We should not remain in ignorance like cats and dogs, thinking, “I am this body, I am American, I am Indian, I am brāhmaṇa, I am kṣatriya, I am Hindu, I am Muslim,” and so on. These are all bodily designations. When one comes to spiritual understanding, he understands ahaṁ brahmāsmi, “I am Brahman.” This is called Brahman realization. It is not that we become Brahman by some practice. Gold is gold, even if it is covered with some dirt, which can certainly be removed. Similarly, we are all Brahman, spirit soul, but somehow or other we have come in contact with these material elements (bhūmir āpo ‘nalo vāyuḥ), and we have acquired bodily coverings. Consequently we think, “I am this body.” This is ignorance, and unless one is enlightened by spiritual knowledge, he remains animalistic. By serving the great, the mahātmās also become great through identifying with the superior energy: (ahaṁ brahmāsmi) “I am Brahman-spirit.” It is not that they become puffed up and think that they are God. Rather, if one becomes Brahman, he must show his activities in Brahman. Spirit is active, and to become Brahman is not to become inactive. Brahman is spirit, and these material bodies are active only because Brahman is within them. If we are active despite our contact with material nature, do we cease to be active when we purify ourselves of the material contamination and establish ourselves in our proper identity as pure Brahman? Realizing “I am Brahman” means engagement in spiritual activity because we are spirit, and our activities are exhibited even though we are contaminated by matter. To become Brahman does not mean to become void but to establish ourselves in the superior nature, which means superior energy and superior activities. To become Brahman means to be completely engaged in rendering devotional service to the Lord. Thus the mahātmā understands that if service is to be rendered, it is to be to Kṛṣṇa and no one else. We have so long served our senses; now we should serve Kṛṣṇa. 1. ahaṁ brahmāsmi means I am a spirit soul and not a body. I have nothing to do with this material body. 2. The realization of ahaṁ brahmāsmi does not mean that the living entity loses his identity. 3. Spirit is active, and to become Brahman is not to become inactive. 4. Brahman realization is not the end of spiritual knowledge. 5. Next one has to ask, “If I am an eternal spirit soul, what is my eternal spiritual activity?” That eternal activity is devotional service to Kṛṣṇa. 6. To become Kṛṣṇa conscious, or spiritually conscious, and to engage in the transcendental loving service of Kṛṣṇa are signs of the liberated stage. I have noticed how so many `mayavadis’ and `jnanis’ (knowledge seekers) argue and write thesis and essays on what is the actual meaning of this statement from vedas. But it is not even surprising that Srila Prabhupada clears the air with such clarity and in a way that we can all absorb it’s essence. 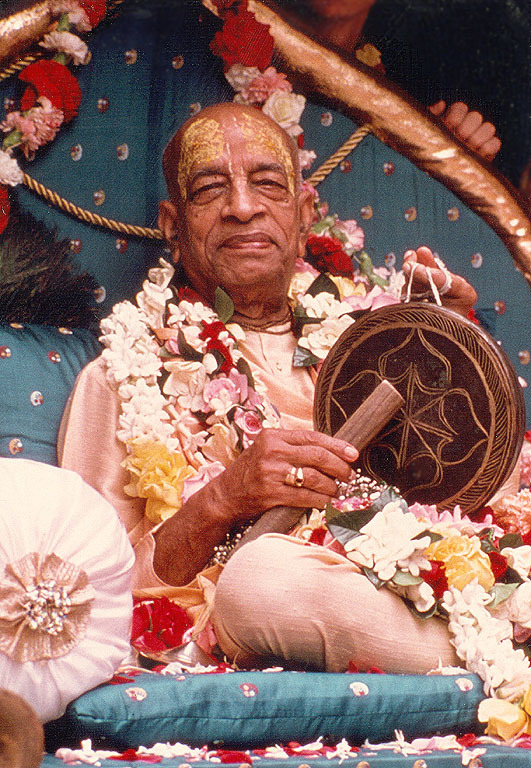 No doubt Srila Prabhupada said that his books would be the “law books for the next 10,000 years’. This entry was posted in Krishna, My realisations, My spiritual Journey, Q&A, Srila Prabhupada and tagged actual liberation, aham brahmasmi, bona fide spiritual master, Brahma sidhi, brahmajyoti, Brahman, I am a spirit soul, Krishna, liberated stage, mahatama, spiritual knowledge, who is a spirit soul. Bookmark the permalink. Concept of Aham Brahmasmi very well summarised Prabhuji. I specially appreciate your efforts to gather Srila Prabhupad’s quotes from various places and and arrange them systemically in your blog. Hari Bol!! Thank you for your encouraging comments and reading the blogs of this shudra. All the nectar is there in the purports of Srila Prabhupada.